Daytona Beach, Florida is one of the most visited places in the United States. Every year thousands of travelers come to enjoy the spectacular beaches, great restaurants, exciting nightlife and of course, NASCAR racing. This area of Florida really does offer something for everyone. No longer is it just a destination for spring breakers but for families as well. Anyone really who wants to have fun in the sun and let loose will have a wonderful time here. There are so many activities to choose from, however, you might have a hard time deciding which attractions to visit. If you’ve gone on vacation to get away from it all, why not really get away from it all by taking to the sky at Daytona Sky Tours. With your own personal pilot, take a scenic airplane ride over the beautiful coastline of Daytona Beach. And, when your adventure is over, you can take home a free video of it to show everyone back home. On those days when it’s maybe too hot out or you need a break from all that fun in the sun, why not head over to Angell & Phelps Chocolate Factory for a free guided tour through their chocolate-making process. 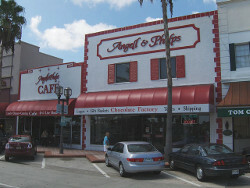 Listed as one of the top 10 sweetest attractions in the U.S., Angell & Phelps is not to be missed if you love chocolate. Nothing gets your heart racing or adrenaline pumping more than being catapulted 300 feet into the air at 100 mph. If that sounds like your kind of fun, head to the Daytona Slingshot, one of the hottest new attractions and let loose, literally. You can go swimming with dolphins Daytona Beach in nearby St Augustine beach. Take a beautiful ride north on A1A and have a chance to go into deep and shallow water with the dolphins. This is a dream come true from many Daytona visitors. This program is really popular so make sure you make your reservation early! A visit to the Museum of Arts and Sciences will get you up close and personal with a 13-foot skeleton of a giant ground sloth that’s 130,000 years old. You’ll also be able to view racing memorabilia, train cars, early American art, Chinese art and African cultural objects. Shows at the planetarium are also a must-see. 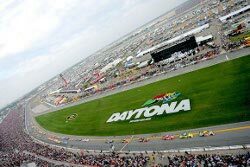 The Daytona 500 Experience is located just outside of the International Speedway’s 4th turn. The facility is super high tech and offers a lesson in racing history as well as hands-on activities. Change tires in a timed pit stop; design and then video-test a racing car; and broadcast a famous race finish. Not to be missed is the racing simulator that puts you in the driver’s seat where you can race against family and friends. There’s also an IMAX experience called NASCAR 3D that features behind the scenes action of an actual race. Why not take a surfing lesson at Daytona Beach Surfing School? Although lessons are offered year round, they provide concentrated week-long sessions for ages 7-17 from May through August. Learn how to carry a surfboard through the surf, how to balance, how to fall, proper positioning for paddling and standing, and how to read the surf for breakers. They provide soft surfboards free of charge and offer both private and group lessons. Between the gorgeous beaches, great food and amount of awesome attractions, Daytona Beach is one of those places that seems too good to be true but totally is.